Gerald Ford was the 38th President of the United States who served in office from August 9, 1974 to January 20, 1977. What was the life of Gerald Ford like? The short biography of President Gerald Ford covers important information and facts about his early life, his family, career and the famous events and achievements of his political life. 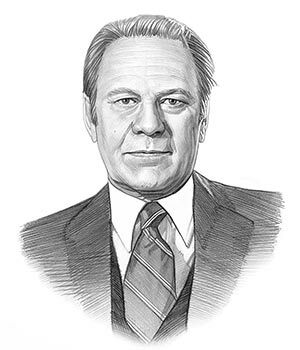 Our short biography of Gerald Ford provides an interesting and easy way to learn about the life of the President. The following important facts provide a fast overview of important facts about President Gerald Ford. Facts and Info: Gerald Ford became the 38th president of America following the resignation of Richard Nixon. He was the only President neither elected to the Presidency nor the Vice Presidency. President Ford granted the disgraced Nixon an unconditional pardon which was extremely unpopular with the voters and probably cost him re-election. For additional info refer to 20 Facts about Gerald Ford. Facts and Info: Gerald Ford was born July 14, 1913 in Omaha, Nebraska. He was born Leslie Lynch King, after his biological father but he was renamed after his adoptive father. Except in formal signature on official documents, he always signed his name as Jerry Ford. He died on December 26, 2006, aged 93, in Rancho Mirage, California. Facts and Info: The career of Gerald Ford included the roles of Lawyer, Politician and Statesman. He received an excellent education at the University of Michigan and Yale Law School. He became the 38th President of America in 1974 and served for 3 years until 1977. Facts and Info: Gerald Ford married Elizabeth Bloomer, called Betty, on October 15, 1948. They were happily married for fifty-eight years. Betty was a highly intelligent, outspoken and determined woman who gained fame as one of the most candid first ladies in history. She established the Betty Ford Center for the treatment of chemical dependency. Gerald Ford and his wife Betty had 4 children: Michael, John, Steven and Susan. Facts and Info: Gerald Ford was a member of the Republican Political Party. He was 61 years old when he was inaugurated as the 38th president. Inauguration is a President's swearing-in ceremony. Gerald Ford became President following the resignation of Richard Nixon. For additional facts refer to his Presidential Cabinet members. Short Biography of Gerald Ford: What he was like! Facts and Info: Gerald Ford was 6 feet in height and weighed approximately 195 lbs. He had blond hair, small blue eyes and a fair complexion. He saw action aboard the Monterey aircraft carrier winning 10 battle stars for his service with the U.S. Navy. Gerald Ford was an avid sports fan and enjoyed tennis, fishing, golf, swimming and skiing. His daughter, Susan, held her senior prom at the White House. Facts and Info: Gerald Ford was subjected to two separate assassination attempts in 1975 by two women. The 1st attempt was by Lynette "Squeaky" Fromme who was a follower of mass-murderer Charles Manson. The 2nd attempt was by Sara Jane Moore who was a one-time FBI informer. During his lifetime he played a key role in important events of the era. At the start of his presidency Gerald Ford granted the disgraced Richard Nixon an unconditional pardon. The pardon was highly controversial derided by critics who claimed that a "corrupt bargain" had been struck between the men. 1975 saw the signing of the Helsinki Agreement by the US and European countries that was designed to reduce tension between the Soviet and Western blocs. 1976 saw the North Vietnamese victory in the Vietnam War. American forces were withdrawn from Indochina as Communist governments took power in Vietnam, Cambodia and Laos. Facts and Info: Gerald Ford died of heart disease on December 26, 2006 in Rancho Mirage, California. Gerald and Betty Ford are buried together in Woodlawn Cemetery, Grand Rapids, Michigan. The short biography of Gerald Ford provides a fast overview of the key facts and events about his life and the accomplishments of his presidential term in office. The following Gerald Ford video enables you to sit back and listen to the history of his personal and political life - a useful educational resource for kids, children and schools learning about the life of President Gerald Ford.